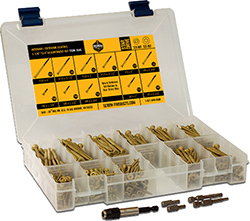 Bronze Star Exterior Star Drive Wood Screw Assortment This economical and compact assortment kit is the perfect accessory for your home, garage or workshop. Fully loaded, this take-anywhere kit is easy enough to carry & slim enough to fit just about any place you need. The ultimate trim & finish head head assortment kit. This is the kit I would want to be with me on every service call, expert pick from the experts at The Deck Store.